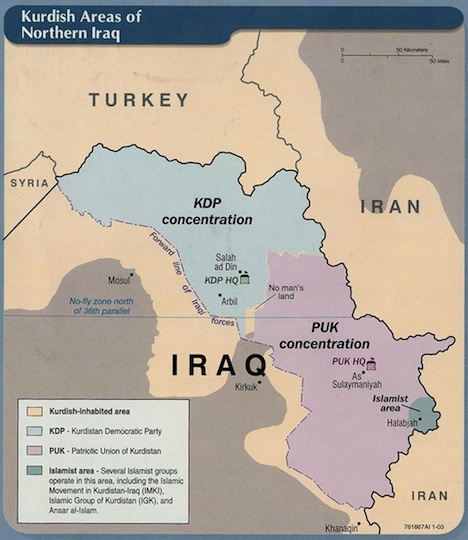 Back in Iraqi Kurdistan, however, Talabani’s party joined forces with the KDP, a party with even deeper roots in the Kurdish independence movement — the KDP had its roots in the Soviet-backed Kurdish national movement of the 1940s. The KDP originally welcomed the first Ba’athist coup in 1963 and the subsequent successful 1968 coup that installed the Ba’athist regime in Iraq, including Saddam, initially as vice president. But mutual enthusiasm soured on both sides, especially in light of Iranian assistance for the KDP, culminating in the KDP’s military effort against Saddam’s regime between 1974 and 1975. 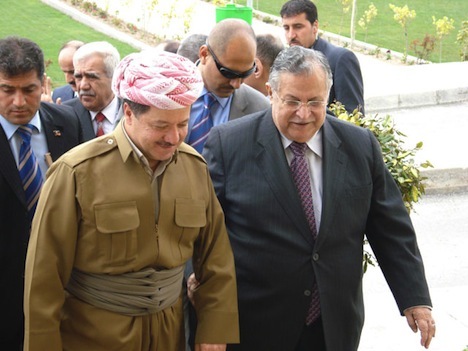 That Kurdish-Iraqi War ended in defeat for the KDP and many top KDP leaders fled to exile in Iran, opening the way for the emergence of Talabani and the PUK. An ongoing power struggle between the KDP and the PUK turned into fully armed civil war between 1994 and 1997. But by the time of the 2003 Iraqi invasion, the PUK and the KDP found common cause in an opportunity to grab Kurdish autonomy once and for all. The two parties have governed, not always harmoniously, ever since, with the PUK’s Talabani holding power as the president of a federal Iraq and the KDP’s Barzani holding power back home in the Kurdish region. Barzani is the son of the KDP’s founder, Mustafa Barzani, and his family is one of the most important in Iraqi Kurdistan, despite the family’s exile to Iran in the 1970s and 1980s. In the previous 2009 elections, a third force emerged to challenge the KDP/PUK hegemony — Gorran, or the Movement for Change (بزوتنه‌وه‌ی‌ گۆڕان‎‎), which won 25 seats in the 111-member Perleman, the Kurdish parliament. Talabani’s absence means that Gorran hopes to make even more inroads, especially in the PUK’s heartland in southern Iraqi Kurdistan. While they won 59 seats together in the previous elections, their relative strengths aren’t much greater than Gorran’s — the KDP holds 30 seats by itself and the PUK just 29. Other parties hold 27 seats in the Kurdish parliament, including three Islamist parties (the strongest is the Kurdistan Islamic Union, which has ties to the regional Muslim Brotherhood) that won 12 seats and including 11 seats set aside for ethnic and religious minorities, including Assyrians, Armenians, Turkmens and other Christians. Given the fragmentation of the Kurdish political scene, and given the longstanding and unwavering support that each of the KDP and the PUK commands in their heartlands (the KDP in northern Kurdistan and the PUK in southern Kurdistan), no single group is likely to win an absolute majority. That means today’s election could result in any of four possibilities: a renewed PUK/KDP administration, an ‘opposition’ administration led by Gorran with support from perhaps minority or Islamic groups, a PUK/opposition coalition or a KDP/opposition coalition. Though the potential end of the longtime PUK/KDP unity may be some cause for apprehension in light of the peace that the Kurdish administration has maintained for the past eight years, the development of a competing marketplace for Kurdish voters is the natural next step in the democratic development of Kurdistan — and a chance to break up the increasingly cozy oil-fueled corruption within both the PUK and the KDP. Previous PostWestgate Mall siege the first test of Uhuru Kenyatta’s mettle as Kenya’s new presidentNext PostGermany (and Hesse) votes today!